Evo & Grace: The WanderLusts: Golcondia Cultured Diamonds, for real and forever. Golcondia Cultured Diamonds, for real and forever. Woman’s Best friend is Diamonds, it is the symbol of engagement of any man to the most love of their life. It is expensive because its forever. In the changing world, Diamonds as jewelry become unimportant due to some luxury that woman of today needs, such as bags, designer bags or even travelling bag or fashion bags. There are also watches that became a collector’s item not only for girls but for man as well. But still Diamonds are the luxury that majority want to have, own or even inherited from. A marriage is not complete without a guy giving a girl the diamond ring to get that yes feeling. It is the ultimate symbol of surrender. As per history, during the middle ages only men wore diamonds as a symbol of courage and virility, the first recorded diamond gift to a woman was in 1477 for an engagement. In science the diamonds is a crystalline form of carbon, formed miles below the earth’s surface, it is the hardest material 58 times harder than anything else in nature. Pearls for instance have a seatback as its value depreciates when cultured farming is introduce, the price even until now is cheaper, and due to farming it’s now easy and fast with mass production as well. That situation is now happening into Diamond family, from well research and study creating diamonds is now easy but not that cheaper. This is the new era of Diamonds. Golcondia, the first Diamond Showroom in Asia located in Shangri-La Plaza Mall here in Mandaluyong City, is now offering cultured diamonds. During a seat-down interview with Golcondia staff, we were educated on how this Culturing technology of diamonds works. From the diamond seed (meaning real diamonds) is put on a certain machine that replicate the process of creating diamonds, the whole process could last from three weeks to one month’s depending on what color they want to achieve. But Golcondia insist to us that it is not fake nor imitation either, it is 100% pure original Diamonds as per content is concern, the brilliance and value is identical compare to the Diamonds that were dig from mines. Plus it saves environment, no pollution and no digging happens. And also it can be pawn if time and emergency needed. Regarding the price, its only 30% cheaper compare to the Diamonds that were mined, this because original diamond is use for the cultivation. For example, 1 Carat (Mined Diamonds) is worth P300, 000., while the cultured one is P200,000 only. 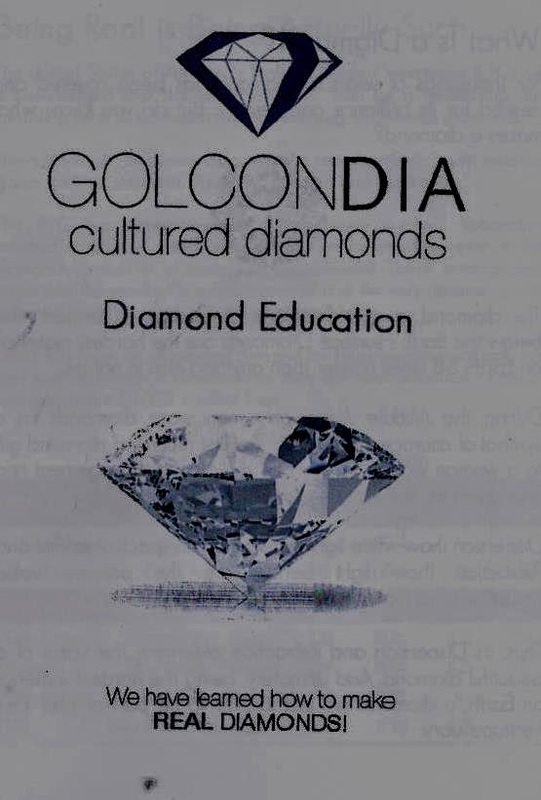 Goldcondia is a mining region in India were the finest Diamonds are found, one of is called Hope Diamond, a famous stones that originated in the same place. In the modern times, “Golcondia” is used to define diamonds with the purest attributes, and this showroom is name to that to echo its heritage, and of course to give tribute to the place where the best diamonds were born. Golcondia in Shangri-La Plaza is from the company of T.Florencio Jewelry, one of Manila’s creative and retailers of fine Diamond Jewelry.